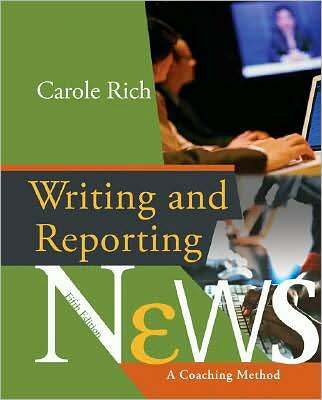 Even though I do find Carole Rich’s Writing and Reporting News to be a very effective textbook — and so do the students (see previous post) — I do have a few suggestions for improvement. One is the book cover. Designing a cover for a media textbook is a challenge, as so many different media (i.e., newspaper, online, television) are included in the book and so many different writing styles. However, the cover for the 5th edition (on right) is more effective than the cover for the current (6th) edition. If you check my previous post, you’ll see the cover for the 6th edition — a news source surrounded by reporters. Based on the heads and faces you can see (not just hands and arms), what is the demographic and ethnic (that one is harder to tell) count? Then look at the microphones and cameras. For a cover selected in 2009, certainly a more diverse group could have been selected and equipment that would show the growing trend (especially for smaller news operations and video shot for the Web) to use audio recorders that produce digital files (rather than tape) and smaller video camers (even Flips). Fortunately in this case, you can’t judge the book by the cover. The content is more up-to-date than the cover is.